ShareGate Desktop 9.0 just rolled out! Here's a look at what's new and what's next for your favorite migration tool. When it comes to SharePoint migrations, I find that two major factors characterize the overall performance of the process: speed, and impact on business operations. How can we make sure to finish the migration as fast as possible while minimizing errors and impact on end users? That’s why I’m thrilled to announce that our latest release, ShareGate Desktop 9.0, now lets you schedule your migrations. Highly requested and long overdue, this new version is packed with features that you've been asking for. We know how important ShareGate Desktop can be for you, whether you’re using it to migrate or to reorganize and restructure your existing environment. That’s why we continue to invest in building the things you want and need. And we love the feedback you send us! Please keep letting us know how we can improve to make your life even easier. It’s simple: ShareGate Desktop now has a new Schedule button next to Start Copy, and it does exactly what you think it does. When you choose this option, the app will save all your configurations and settings and trigger the migration exactly when you want it to happen—no PowerShell scripting required. With ShareGate Desktop 9.0, you can now schedule your migration with the click of a button. The options are straightforward and similar to the schedule options found in our reports. Microsoft tends to be a lot more lenient with its throttling during non-business hours—in fact, it recommends migrating during this time. Thanks to the new scheduling capabilities built into the ShareGate Desktop app, you can now benefit from better speeds without having to stay at the office during those nights and weekends. Some customers prefer to set up their migration paths and let end users continue to work at the source while the copy happens. 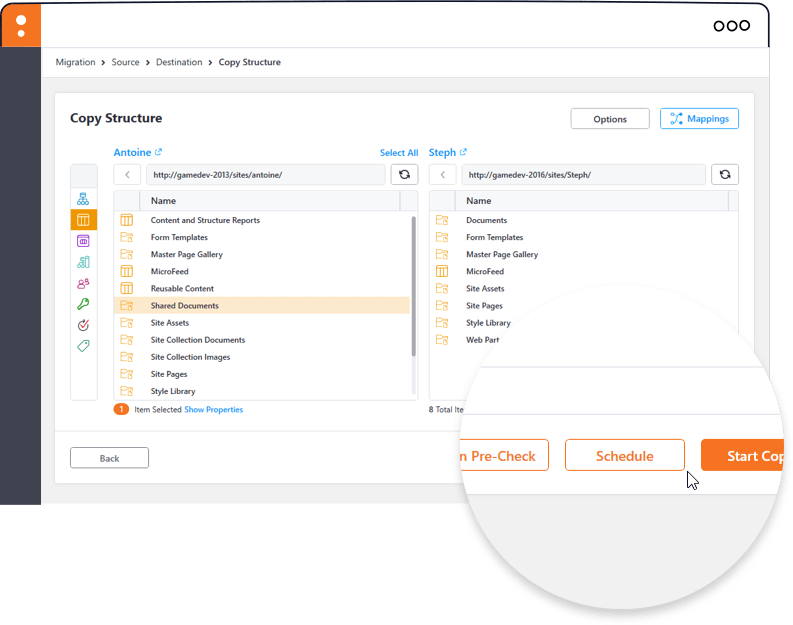 To allow this type of scenario during your own migration, you can now use ShareGate Desktop to set a recurrence on your copy schedule and enable syncing between your source and destination. It’s been the number-one question since we first launched ShareGate Desktop: “how fast can I migrate?”. While the number of variables affecting migration speeds is simply too high to allow a precise answer, we never stop looking for ways to improve what we can control. If you use Insane Mode to copy content to Office 365, you’ll see a noticeable improvement in copy speeds for large volumes of data. How did we do it? In a nutshell, we made improvements to the way ShareGate Desktop handles migration queues, thus reducing the heaviness of a given migration as it gets loaded with thousands of items to copy. In short, if you’ve got lots to move, ShareGate Desktop can do it faster than ever. So, in this release, we made sure you could move those modern SharePoint pages—and their associated modern web parts—around as needed. Whether you’re on SharePoint 2019 or SharePoint Online, you can always use ShareGate Desktop to migrate or reorganize what you have. What’s next for ShareGate Desktop? Wow—what a year it’s been. With so much going on here at ShareGate, we’re more excited than ever to share our ideas for the future with you and get your feedback. ShareGate Desktop will continue to be the one tool you need to migrate to Office 365 and subsequently reorganize and restructure your environment. We’ll also ensure ongoing support for any future on-premises releases. Thanks for trusting us with moving your organization’s content to the cloud. As SharePoint continues to evolve and become part of a greater suite for workplace productivity, so will ShareGate Desktop in its role of helping you move what you need to better adopt it.